The continuous arm Windsor is the favorite for style, strength and comfort. The dramatic sweep of the back-arm rail has the strength and beauty of a suspension bridge. It eliminates the need for any joinery between the back and the arms, or for any other rail across the sitter's back. All stock for my chairs is riven from fresh logs ~ that is, the roughed-out pieces are split out along the grain ~ allowing me to test the workability of the wood and to see that each piece will follow the grain. 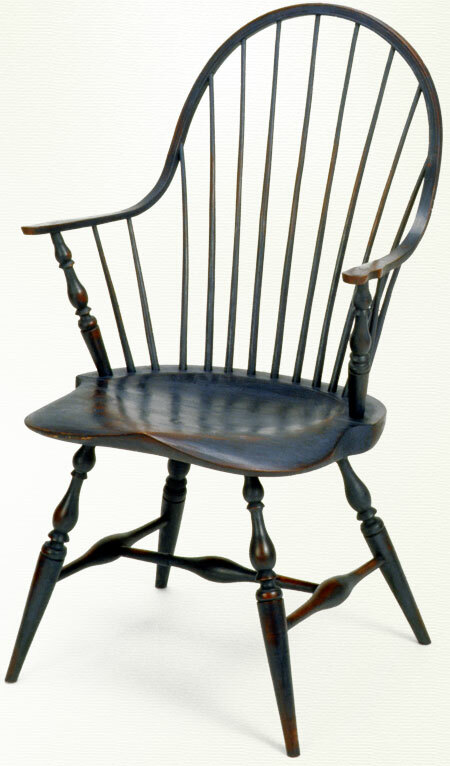 Three or four species of native wood are used for the parts of the chair to which they are best-suited: pine seat (usually one piece), hard maple turnings, white oak bows, and ash, oak or hickory spindles. The old system is used wherein the green middles of the selectively dried turnings shrink down onto the dried pre-shrunken ends of the rungs. Also, a tapered fit is used where the legs enter the seat and at both ends of the arm posts, ensuring that these joints will remain tight. My most popular finish is of hand-polished and oiled milk paint. I often use a top color that is rubbed through at points of natural wear to reveal a different under color. These, and other traditional methods, allow me to guarantee my work for a lifetime ~ the original owner's or mine!